99 Euros (~$111) tablet. The I.onik Windows 8.1 tablet is available for less than 100 Euros (~$112). Is this a worthy investment? 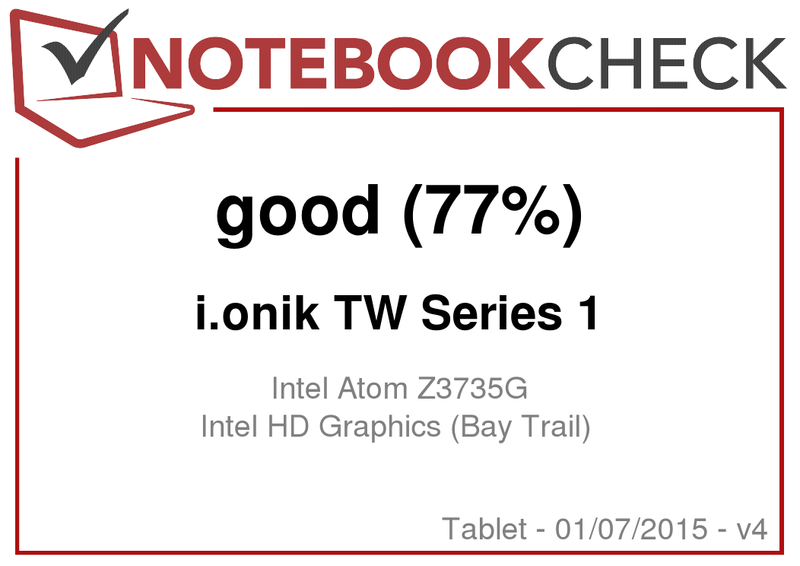 The I.onik TW series 1 is a cheap 8-inch tablet running Windows 8.1. I.onik is hoping to win customers with its low price of 99 Euros (~$111), but to hit such a low price the memory had to be limited to a mere 16 GB. In our review, we will find out how the tablet performs. The competition of the I.onik tablets is numerous and we will be using the 8-inch Windows tablets which we recently tested for comparison: the Point of View WinTab 800W, the Dell Venue 8 Pro 3845 and the HP Stream 8 5900ng. The case of the I.onik tablet is made primarily of synthetic material, but a large portion of the back is composed of metal. The synthetic pieces are colored white whereas the metal elements stand out with a bright silver tone. Despite the low price, the device shows no major workmanship flaws. The sturdiness is quite good as the tablet barely gives way under pressure. In contrast to the tablets of some major manufacturers (HP Stream 8 5900ng, Dell Venue 8 Pro 3845), the test model is equipped with a Micro-HDMI port. This is really helpful as the device can be used as a playback device with the home TV/monitor. The connectivity holds no other surprises and is standard. The tablet has two cameras, both of which have a resolution of 2 MP. The 8-inch tablet has no accessories aside from the charger. The OS is Windows 8.1 (32-bit) + Bing. 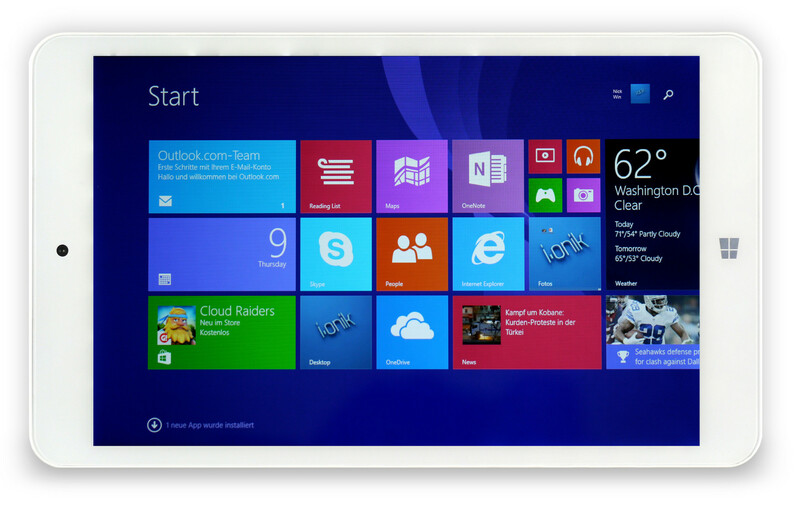 The tablet can run the 64-bit version of Windows but the 32-bit version is more conservative with resources. Owners of the tablet will receive a 1-year license for MS Office 365 Personal. This license has to be activated within a certain time, otherwise it will expire. The I.onik TW series 1 - 8-inch. The back has a partial metal finish. 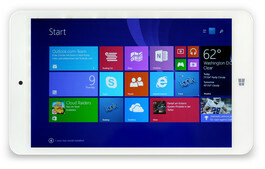 The tablet is equipped with a capacitive touchscreen which can recognize up to five fingers at a time. The screen reacts quickly to input and we did not notice any flaws while operating it. 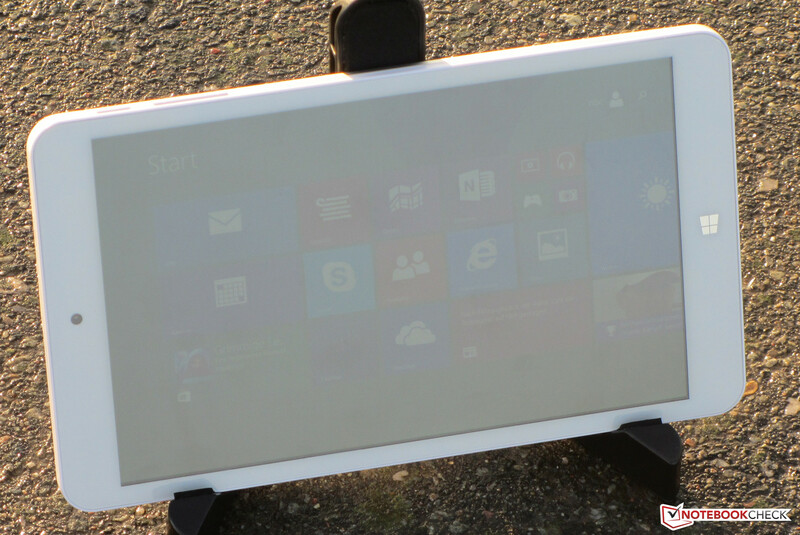 The reflective 8-inch panel works with a native resolution of 1280x800 pixels. The screen has a brightness of 201.4 cd/m², which is far too low for a tablet. For us, 250 cd/m² is the bare minimum. Contrast (594:1) and black value (0.35 cd/m²) are decent. With factory settings, the tablet has an average DeltaE 2000 deviation of 6.38. Ideally, this number would be lower than 3. Furthermore, the display has a slight blue tinge. The IPS panel ensures good legibility from all angles but the low brightness makes outdoors use uncomfortable. As such, the tablet is primarily intended for indoors use. I.onik offers an 8-inch Windows 8.1 tablet with its TW series 1. The performance of the device is sufficient for office and Internet use. The use of desktop applications is possible, but the lack of space is a hefty hurdle. Of course, for the price of 99 Euros (~$111), this drawback may be reasonable. 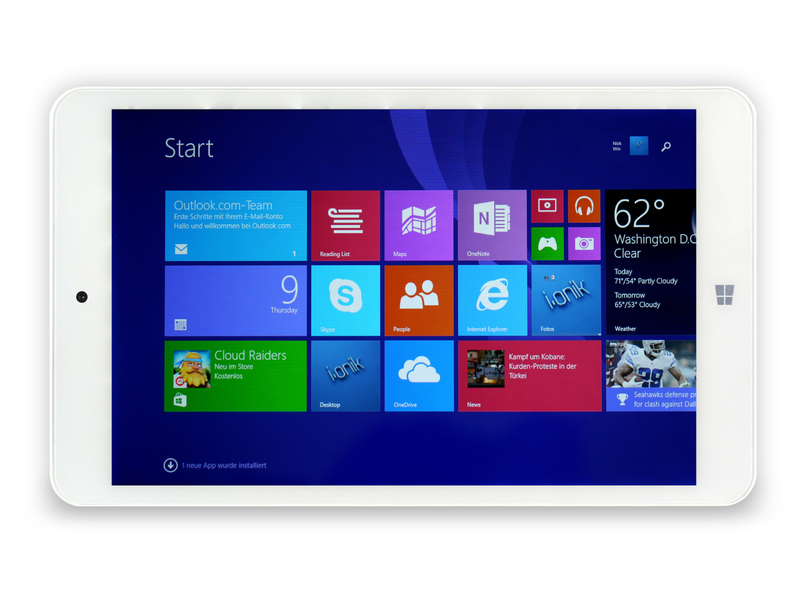 The Atom Z3735G quad-core CPU of the tablet operates at a base clock speed of 1.33 GHz. Turbo allows it to boost up to 1.83 GHz. The Turbo can be used on battery or when plugged in. 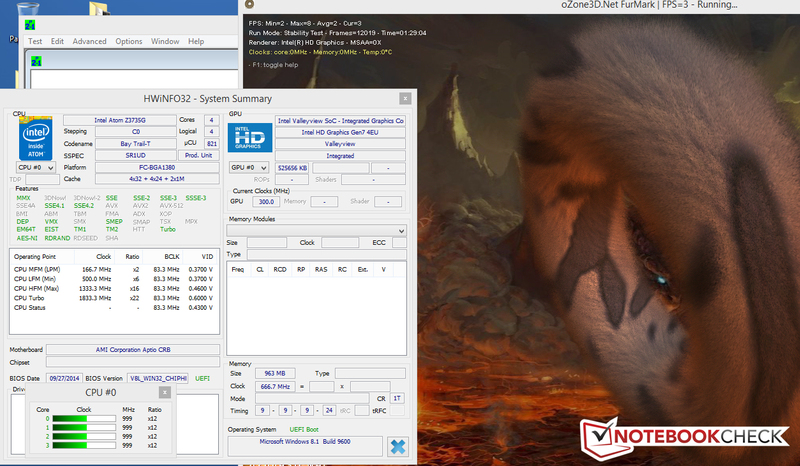 Single-thread tests of the Cinebench benchmark record the CPU operating at 1.58 to 1.83 GHz. Multi-thread tests are run at 1.58 GHz. The benchmark results of the CPU place it at the bottom end of our CPU table. Other Atom models and the AMD APUs of the E and A series keep it company. 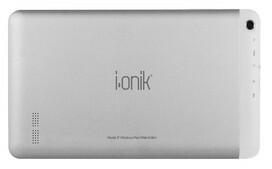 The conservative hardware of the I.onik tablet is ideally suited for surfing the web and light office use. Full HD videos run smoothly on the tablet. However, desktop applications suffer quite a bit due to the limited storage and meager RAM of 1 GB. For example, we could not install the PCMark 8 benchmark and the 3DMark benchmark (2013) due to a lack of space. The score of our tablet in the PCMark 7 benchmark matches the scores of the Dell Venue 8 Pro 3845 and the HP Stream 8 5900ng. The test model uses eMMC storage of 16 GB. About 5 GB is occupied by the recovery partition and the Windows installation takes a major portion of the remaining 11 GB, leaving around 5.3 GB for the user. Of course, the latest Windows updates will reduce this already dismal number to a mere 3 GB. If you are planning to use the tablet for surfing the web and watching videos, then you should be able to comfortably use the device. A simple method to add extra storage space is to relegate the recovery partition to a USB drive which is a function of Windows 8.1. Furthermore, the MicroSD slot can increase the available storage space. Buyers will also appreciate the Microsoft Cloud service OneDrive which is available for free for one year. The transfer speeds of the eMMC storage are quite normal. The I.onik tablet uses the Intel HD Graphics GPU for graphics output: the chip supports DirectX 11 and operates at (up to) 646 MHz. The 3DMark results hold no surprises for us: the tablet scores as well as similar devices. The results place our test model at the bottom end of the performance table. The AMD competition includes the Radeon R3 (Mullins/Beema) core, which is more powerful. Gamers will not enjoy this table much as only games from the Windows Store will run well on this tablet. Modern 3D games will not run well, with a few exceptions. Furthermore the device lacks the space to install such games. The TW series 1 in the stress test. The stress test often pushes devices to their limits as the combination of Prime95 and Furmark for (at least) 1 hour is quite intense. The tablet displays the same behavior in the stress test whether plugged in or on battery: the CPU and GPU run at 1.58 GHz and 620 MHz for the first two minutes. After this time, their speeds decrease slowly. The speeds of the CPU and the GPU continue to rise and fall throughout the test. We did not observe an overheating of the tablet. During the stress test, the device only seems to cross the 40 °C mark near the CPU. (±) The average temperature for the upper side under maximal load is 32.6 °C / 91 F, compared to the average of 30.7 °C / 87 F for the devices in the class Tablet. (-) The maximum temperature on the upper side is 46.6 °C / 116 F, compared to the average of 34.8 °C / 95 F, ranging from 22.2 to 51.8 °C for the class Tablet. The speakers of the tablet are placed on the back of the device. It provides a clear sound without bass. Speech is clear and understandable. For a better sound, we recommend headphones or external speakers. While idle, the I.onik tablet is very conservative. The brightness of the panel has very little impact on the battery. During the stress test, the power consumption fluctuates heavily as the speeds of the CPU and GPU are continuously fluctuating. The max power consumption is 9.1 W.
In the practical WLAN test, our script automatically loads a new website every 40 seconds. The power-saver mode is turned on and the brightness is set to around 150 cd/m². The tablet runs for 5:39 hours, which is a decent runtime. 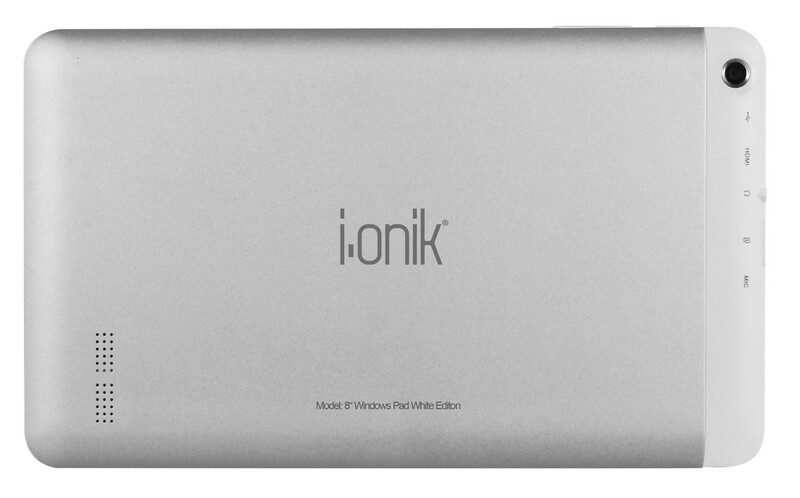 The I.onik TW series 1 offers buyers an 8-inch Windows 8.1 tablet for 99 Euros (~$111). The touch interface is smooth and we did not experience any major issues while using desktop mode. Despite the relatively small symbols and buttons, the device was easy-to-use and we could accurately hit the desired surface after a short period of trial and error. Despite being equipped with the actual Windows 8.1 (no Windows RT), this tablet is primarily intended for surfing, apps and watching media. Desktop applications quickly hit speed bumps due to the limited storage and the 1 GB of memory. As such, few applications will find room on this device. The IPS screen of the tablet is not very bright, but it offers good viewing angles and decent contrast. We recommend using the tablet indoors to avoid straining the eyes. If you can come to terms with the limitations, then this is a solid surfing tablet for home use with a decent battery life. However, if you are dissatisfied with the offering then we recommend a tablet which offers at least 32 GB storage, as in our experience, those tablets are much more balanced. The low price and fluid touch interface. More storage - 32 GB is a minimum for a Windows tablet. I.onik includes an HDMI interface in the tablet, whereas well-known manufacturers like HP and Dell sacrificed this port in their cheap 8-inch Windows tablets. Dell Venue 8 Pro, Toshiba Encore 2 WT8-B-102, HP Stream 8 5900ng, Lenovo ThinkPad Tablet 8, Point of View Mobii WinTab 800W, Acer Iconia W4-820-2466, Asus Memo Pad 8 ME181CX, LG G Pad 8.0 V480.